Objective To determine the prevalence and risk factors for suboptimal vitamin D status in Korean adolescents and to assess its relationship with atopic dermatitis (AD) and asthma at a national level. Design This is a cross-sectional study with data from the Korean National Health and Nutrition Examination Survey. Information regarding socioeconomic characteristics, clinical data and environmental factors was collected. Blood and urine samples were taken for vitamin D and cotinine, respectively. Descriptive and multivariable logistic regression was performed on the data. Participants 2515 individuals aged 10–18 years who participated in the Korean National Health and Nutrition Examination Survey from 2008 to 2011. Main outcome measures Vitamin D status was determined through measurement of serum 25-hydroxyvitamin D (25OHD). Smoking status was classified based on the urine cotinine level. Physician diagnosed with AD and asthma were assessed using a questionnaire. Results Overall, 73.3% of the subjects were vitamin D deficient (25OHD <20 ng/mL) and 24.4% of the subjects were vitamin D insufficient (25OHD, 20–29.9 ng/mL). Older age (p<0.001), female gender (p<0.001), urban residence (p=0.019), higher body mass index (p=0.003) and sampling in winter months (November–March) (p<0.001) were independently associated with low serum 25OHD levels. With cotinine verification, 18.2% of the participants were classified as active smokers, and 43.4% were classified as passive smokers. After adjusting for potential confounders, serum 25OHD status showed no association with AD or asthma. Conclusion Vitamin D deficiency is highly prevalent in Korean adolescents. Cotinine-verified prevalence of smoking was also high, but its relationship with vitamin D deficiency was not confirmed in our study. Above all, our results provide epidemiological evidence against the association of vitamin D status with AD and asthma at the national level among Korean adolescents. The strength of this study is that a nationally representative sample was used as the study population. This study is unique in that a cotinine-verified smoking status was adopted. Cotinine (a metabolite of nicotine) is a specific marker of smoking with high sensitivity. The limitation of the study is its cross-sectional design and the lack of data on the population’s dietary and supplemental vitamin D intake. Also, the study has recall bias because the diagnoses of allergic conditions (atopic dermatitis (AD) and asthma) were self-reported. The definition of asthma and AD was physician-diagnosed asthma and AD which may have missed some children with symptomatic asthma and AD who have not been diagnosed. Vitamin D is essential for skeletal health and bone growth and its deficiency has been associated with skeletal deformities in children and fracture risk in adults. Recent studies have also identified the previously unanticipated roles of vitamin D in the immune system, cardiovascular system and cancer prevention.1 2 Despite growing health concerns over low vitamin D status, few nationwide studies have been performed to evaluate vitamin D deficiency in the Korean paediatric population.3 4 Suboptimal vitamin D level was reported in 70% of the US children (9% vitamin D deficient, 61% vitamin D insufficient),5 and it was found in 41.7% of the children from New Zealand.6 Korean adolescents are theoretically at increased risk for vitamin D deficiency because of the high latitude (34–38°N), culturally vigorous sun protection, reduced outdoor activity and lack of vitamin D-fortified food. The increasing prevalence of allergic diseases is a worldwide phenomenon and it is strikingly more evident in the younger population compared with adults.7 Vitamin D has immunomodulatory functions, and its relationship with allergic disease has been evaluated in a number of studies.8–15 While some authors have reported about the protective role of vitamin D in atopic dermatitis (AD), asthma, allergic rhinitis and allergic sensitisation in childhood, other authors have shown a deleterious effect. Although the exact cause of such conflicting results is not known, racial difference may be a contributing factor. Unfortunately, nationwide studies on vitamin D and allergic disease are limited and are mostly from western countries. In this study, we aimed to identify the prevalence and risk factors for vitamin D deficiency in Korean adolescents and to assess its relationship with AD and asthma at the national level. Cotinine-verified smoking status was adopted in this study. This study was based on data acquired from the Korean National Health and Nutrition Examination Survey (KNHANES), a survey conducted by the Korea Centers for Disease Control and Prevention to provide nationally representative and reliable statistical data regarding the health, behaviour associated with health, nutrition and food intake status of the Korean population. Data were collected from 2008 to 2011, which corresponds to the second and third year of KNHANES IV (2007–2009) and the first and second year of KNHANES V (2010–2012). The survey included a health interview, a nutritional survey, physical examination and blood and urine tests. The institutional review board at the Korea Centers for Disease Control and Prevention/Incheon St. Mary’s Hospital, The Catholic University of Korea (IRB number: OC17ZESI0055) approved the protocol, and all participants and their parents signed informed consent forms. Both KNHANES IV and V adopted the stratified multistage cluster sampling design by using the rolling-survey sampling method. The rolling sample collected each year is the probability sample representing the general Korean population, and it is homogeneous and independent of each other. In 2008, 2009, 2010 and 2011, a total of 37 753 individuals were sampled. The study population was further limited to 4598 adolescents aged 10–18 years. Among the 4598 participants, we subsequently excluded the following participants: those whose serum 25-hydroxyvitamin D (25OHD) levels were not measured; those without urine cotinine levels; those who did not completely answer the questions regarding AD or asthma; those without body mass index (BMI) measurement and those who had a chronic disease that may affect vitamin D metabolism. Finally, a total of 2515 participants (1314 males and 1201 females) were eligible for analysis. Factors were categorised to analyse the risk factors for vitamin D deficiency. Age and BMI were continuous variables while season of sampling was categorised into winter months (November–March) and summer months (April–October).18 The region of residence of each participant was grouped as follows: urban (Seoul, Gyeonggi, Busan, Daegu, Incheon, Gwangju, Daejeon and Ulsan) and rural (Gangwon, Chungbuk, Chungnam, Jeonbuk, Jeonnam, Gyeongbuk, Gyeongnam and Jeju).19 Monthly income was standardised according to the number of family members (monthly income/number of family members) and it was divided into the following four quartile groups: lowest, lower middle, higher middle and highest. Participants who performed moderate physical activity for more than 30 min per day on more than 5 days a week and/or strenuous physical activity for more than 20 min per day on more than 3 days a week were assigned to the regular exercise group. Regular walking was designated as ‘yes’ for those who walked for more than 30 min per day on more than 5 days a week.19 Smoking status was divided into three groups based on the urine cotinine level, which are as follows: non-smokers (<5 ng/mL), passive smokers (secondhand smoking) (5–100 ng/mL) and active smokers (>100 ng/mL).19–21 Urine cotinine level was measured by chromatography mass spectrometry using the Perkin Elmer Clarus 600T (PerkinElmer, Turku, Finland). All data were measured in a standardised manner and reviewed by the central quality control centre. The following question was used to assess physician-diagnosed AD in each participant: “Have you been diagnosed with AD by a doctor?” or “Have you been told by a doctor that (your child) had AD?” Physician-diagnosed asthma was also determined using similar questions. Statistical analyses were performed using an SAS survey procedure V.9.2 (SAS Institute), and two-sided p values of less than 0.05 were considered statistically significant. To produce unbiased national estimates representing the general Korean population, we used KNHANES sample weights accounting for the complex sampling design to each participant. To compare the mean serum 25OHD levels among categories of each possible predicting factor, Student’s t-test or analysis of variance (ANOVA; followed by Tukey-Kramer for multiple comparison) was used. Univariate analysis was performed to evaluate the association of the possible predicting factors, AD and asthma with vitamin D deficiency. Participants’ characteristics were described using means and standard errors for continuous variables and numbers and percentages for categorical variables. Here, the Student’s t-test or ANOVA was used for comparing continuous variables, as appropriate, and Rao-Scott χ2 test was used for comparing categorical variables. Variables with a p value <0.05 in univariate analyses were included in the multivariate regression model for exploring factors associated with serum 25OHD. To estimate the mean serum 25OHD levels in participants with and without AD and asthma, we performed simple and multiple linear regression analyses using the generalised linear model for a complex survey design. The estimated means were calculated as follows: no adjustment for potential confounders and confounder adjustment for age, gender, region, BMI, smoking and season of sampling. To estimate the ORs for AD and asthma according to quartiles of serum 25OHD levels, we conducted simple and multivariate logistic regression analyses by using the generalised linear model for a complex survey design. The ORs and 95% CIs were calculated in the following ways: no adjustment for potential confounders and confounder adjustment for age, gender, region, BMI, smoking and season of sampling. A total of 2515 subjects (1314 males and 1201 females, age: 14.4±0.1 years) were included in the study. Table 1 summarises the baseline data of the participants. The mean BMI of the study population was 20.9 kg/m2 (SE: 0.1). Blood samples were drawn more frequently in April–October (58.4%) than in November–March (41.6%). The urine cotinine-verified smoking statuses were as follows: active smoking 18.2%, passive smoking 43.4% and non-smoking 38.4%. The prevalence of AD and asthma in the study population were 10.6% and 4.1%, respectively. The mean concentration of serum 25OHD in the 2515 subjects was 16.7 ng/mL (SE: 0.2), with a range of 3.0 to 46.2 ng/mL. Overall, 1843 subjects (73.3%) were vitamin D deficient, 613 subjects (24.4%) were vitamin D insufficient and 59 subjects (2.3%) were vitamin sufficient (figure 1). Girls had a significantly lower mean serum 25OHD level than boys (16.0±0.2 ng/mL vs 17.3±0.2 ng/mL, p<0.001), and subjects sampled in winter months (November–March) had lower serum 25OHD levels than those sampled in summer months (April–October) (14.7±0.2 ng/mL vs 18.1±0.2 ng/mL, p<0.001). Passive smoking (vs non-smoking) and urban residence (vs rural) were also associated with statistically lower serum 25OHD levels (p=0.038 and p=0.002, respectively) (table 2). 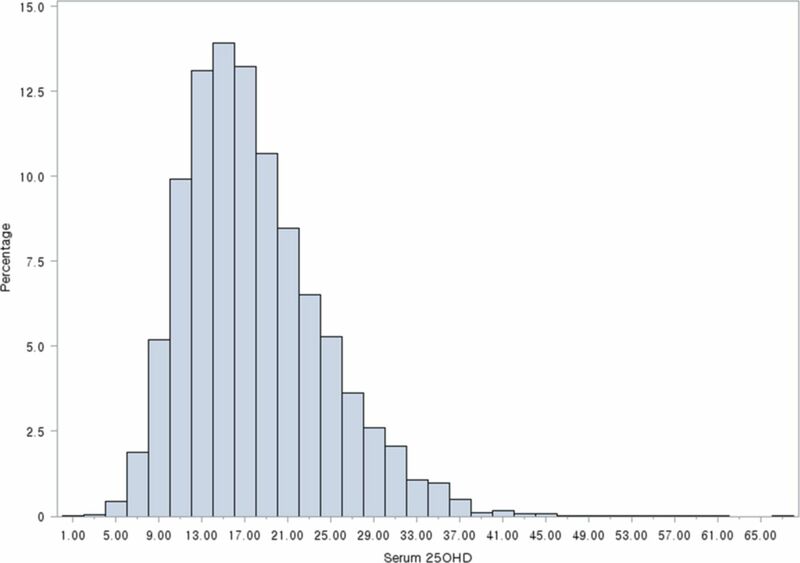 Histogram of serum 25-hydroxyvitamin D (25OHD) levels. Univariate analysis revealed that age (p<0.001), gender (p=0.003), region of residence (p=0.011), season of sampling (p<0.001), BMI (<0.001) and smoking status (p=0.008) were associated with vitamin D deficiency (table 1). Multivariate linear regression analysis of serum 25OHD levels was performed using variables that had a p value <0.05 in univariate analyses. Older age (p<0.001), female gender (p<0.001), urban residence (p=0.019), higher BMI (p=0.003) and sampling in winter months (November–March) (p<0.001) were independently associated with low serum 25OHD levels (table 3). Multivariate ordinal logistic regression analysis of serum 25OHD showed similar results (table 4). Univariate analysis demonstrated that vitamin D deficiency was not significantly associated with AD (p=0.468) or asthma (p=0.538) (table 1). Multivariate logistic regression showed that vitamin D deficiency had no association with AD and asthma after adjusting for age, gender, region of residence, BMI, smoking and season of sampling. The adjusted OR for AD and asthma increased across categories of serum 25OHD (1.00 (reference) for ≥30 ng/mL, 1.14 and 4.87 each for 20–29.9 ng/mL, and 1.52 and 5.31, respectively for <20 ng/mL), but it was not statistically significant (p=0.8078 (AD) and p=0.1360 (asthma) for 20–29.9 ng/mL and p=0.4271 (AD) and p=0.1042 (asthma) for <20 ng/mL) (table 5). Univariate or multivariate analyses with serum 25OHD levels as a continuous variable showed similar results, regardless of the adjustment (table 6). In our cross-sectional study of Korean adolescents, Vitamin D deficiency was very common, where the mean concentration of serum 25OHD was 16.7 ng/mL with 73.3% of the subjects being vitamin D deficient (serum 25OHD <20 ng/mL). Potential explanations for this remarkably low vitamin D status observed in Korean children include, but are not limited to, pigmented skin (skin pigmentation is known the reduce the skin’s production of vitamin D in East Asian populations),3 vigorous use of sunscreens and possibly dietary factors. The Dietary Reference Intakes for vitamin D from the Institute of Medicine (2010) and the American Academy of Pediatrics state that the adequate intake (AI) of vitamin D is 15 µg/day for children.22 23 However, in the Dietary Reference Intakes for vitamin D for Koreans published in 2010, the AI of vitamin D for children is claimed to be 5 µg/day,24 which we feel is too low. Exposure to sunlight, specifically ultraviolet B (UVB), leads to vitamin D synthesis in the skin, which provides most of the vitamin D requirement of an individual. In Korea (latitude: 34–38°N), vitamin D is synthesised mostly between April and October (summer months),25 which was apparent in our study. The finding of an inverse relationship of age, female gender, urban residence and BMI with vitamin D status is in accordance with previous studies.3 4 26–28 It has been previously shown that there is a consistent decline in physical outdoor activity over the school age years. The prevalence of physical inactivity is higher in girls than in boys, and it is greater in obese children than in their normal-weight peers. The lifestyle in big cities is also sedentary, and it is therefore possible that age, gender, place of residence and BMI may act as surrogate indicators for sunlight exposure through their association with physical activity. In addition to limited sunlight exposure from physical inactivity, the inverse association of BMI and urban residence with vitamin D levels can be explained by sequestration of vitamin D in fat tissues29 and UVB blockade due to air pollution. This nationwide study is particularly meaningful as it is the first to measure both serum 25OHD and urine cotinine in a population of 2515 Korean adolescents. Smoking has been quoted as a significant determinant of serum 25OHD in a number of studies,20 21 28 30 including one from Taiwan,28 where passive smoking was independently associated with low serum 25OHD. To identify the effect of smoking on serum 25OHD in Koreans, we adopted urine cotinine, which is presently the biomarker of choice for assessing tobacco smoke exposure.31–34 KNHANES normally assesses a person’s smoking status via a survey. For those who are aged 19 years and above, detailed questions are asked regarding the presence and history of active and passive smoking, but for those who are aged less than 19 years, the questions are much more limited. There is currently no data with regards to passive smoking in Korean adolescents and the survey only determines the presence of active smoking in subjects aged between 12 and 18 years. Omissions and false responses are common in this age group35 which impede accurate assessment of the smoking status, and to improve accuracy, we adopted the cotinine-verified smoking status in our study. Urine cotinine level was measured for a limited time period (2008–2011), and this measurement has only been performed for those aged 10 years and above, which resulted in an inevitable reduction of our study population. We used a urine cotinine cut-off value of more than 100 ng/mL to discriminate smokers from non-smokers and 5 ng/mL as a threshold for non-smokers exposed to secondhand smoking based on published values.31–33 With cotinine verification, 18.2% of the participants were classified as active smokers, 43.4% of the participants were classified as passive smokers, and 38.4% of the participants were classified as non-smokers, where the percentage of smokers (active and passive) was higher than what we expected. Some studies have indicated that an adequate concentration of vitamin D is protective against allergic disease in children.8 9 15 37 38 However, most of these findings have been reported in western countries and only a few studies have been performed in Asia. We consider our investigation meaningful because differences among ethnicities and subjects of various age groups can possibly affect the results. In this national level study, the risk of AD and asthma were not dependent on serum 25OHD. The present study results, as well as prior studies which showed little association between vitamin D deficiency and AD,10–12 28 raise questions on the suggestion that vitamin D may be used to prevent or treat AD. In fact, a Cochrane review found no evidence for an effect of vitamin D supplementation on AD.39 The beneficial effect of sunlight on AD has been well documented, but this is probably due to the anti-inflammatory and antimicrobial effects of UV and not those of vitamin D.
As in AD, there has been considerable controversy over the relationship between vitamin D levels and asthma in children. While some studies showed an inverse relationship between vitamin D levels and current wheeze and asthma severity,8 others such as Hollams et al 40 showed no significant cross-sectional association between serum vitamin D levels and current asthma. Our study too did not find any relationship between vitamin D level and asthma, but further studies would be needed to determine a causal relationship and its mechanism. This study has several notable strengths. The sampling of adolescents across a broad age range, a large sample size with robust data collection, incorporation of objective markers of smoking status, and a thorough analysis strengthen the results of this study. Limitations of the study include its cross-sectional design and lack of data on dietary and supplemental vitamin D intake. Also, the study is prone to recall bias because diagnoses of allergic conditions (AD and asthma) were self-reported. The definition of asthma and AD were physician-diagnosed asthma and AD, which may have missed some children with symptomatic asthma and AD in the population who have not been diagnosed. Although season adjusted, deseasonalisation of vitamin D levels with an algorithm41 may have further increased the accuracy and strength of our study. In conclusion, a high prevalence of vitamin D deficiency was noted in Korean adolescents aged 10 to 18 years. For high-risk individuals of vitamin D deficiency, we suggest vitamin D supplementation and food fortification. Adequate outdoor activity should also be emphasised in Korean adolescents, especially high school students, via media promotion and public health plans by schools and government. We found no apparent association between the cotinine-verified smoking status, AD and asthma with vitamin D deficiency, which merits further study.
. Season and ethnicity are determinants of serum 25-hydroxyvitamin D concentrations in New Zealand children aged 5-14 y. J Nutr 2005;135:2602–8.
. Worldwide time trends in the prevalence of symptoms of asthma, allergic rhino-conjunctivitis, and eczema in childhood: ISAAC Phases one and three repeat multi-country cross-sectional surveys. Lancet 2006;26:733–43.
. Effect of serum cotinine on vitamin D serum concentrations among american females with different ethnic backgrounds. Anticancer Res 2015;35:1211–8. Contributors EJB, SHC, JDL and HSK made substantial contributions to the conception or design of the work. JYH and HSK had role in the acquisition, analysis and interpretation of data tor the work. EJB, SHC, JDL and HSK drafted and revised the work and all authors gave final approval and agreed to be accountable for all aspects of the work. Funding This study was supported by a grant from the Korean Healthcare Technology R&D project, Ministry of Health and Welfare, Republic of Korea (grant no HN15C0105). Disclaimer The funders of this study had no role in study design, collection, analysis and interpretation of data, writing of the manuscript or decision to submit for publication. Ethics approval The institutional review board at the Korea Centers for Disease Control and Prevention/Incheon St. Mary’s Hospital, The Catholic University of Korea (IRB number: OC17ZESI0055) approved the protocol. Data sharing statement All data from the study, published and unpublished, are available with the principle investigators. The data are managed under the Department of Dermatology, Incheon St. Mary’s Hospital, The Catholic University of Korea, Incheon, Korea.